The fourth album of “Surround Scape” series that provides an interaction of music and nature sound in surround, a concept brought by Mick Sawaguchi, the leader of surround sound recording. In this album, Atsuya Okuda plays “hocchiku”, the original form of “shakuhachi” flute, and it blends with the sound from Palawan Island, the Philippines. The island is one of World Heritages where many nature lovers visit from all over the world. Mick made full one-week field recording in the island’s best areas guided by the local park ranger. 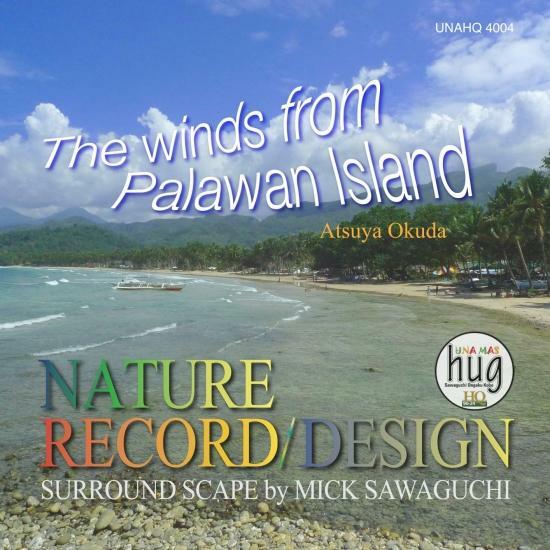 Palawan is unique with the articulated voices of birds and small animals in the tropical mangrove jungle, the ocean wave sound in the long and shallow seashore, and the noise of sudden squalls, all totally different from the environmental sound in Japan. The contrast of the floating tones of hocchiku in the exotic nature sound will draw a new picture of world in your imagination.